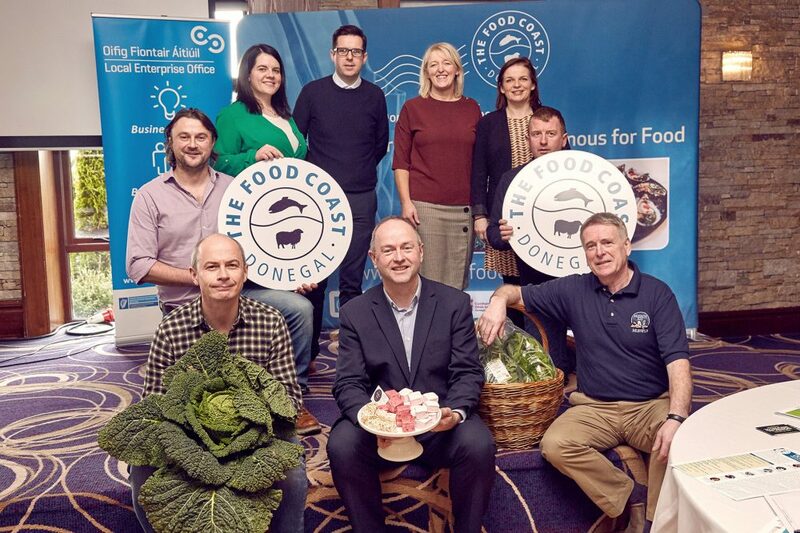 The growing strength of the food sector in Donegal was demonstrated clearly again last week when almost 130 food producers, chefs and buyers attended a packed-out event hosted by the Donegal Food Coast – Donegal’s Good Food Initiative. The meet the producer event in the Silver Tassie Hotel saw food consultant James Burke joined on stage by Maurice McGeehan executive chef at Airbnb and by Bib Gourmande winner Conor Mee of the Courthouse Restaurant, Carrickmacross. Local producers, Hugh Wilhare of Mulroy Bay Mussels and Lee Gildea of Gildea’s Farm Butchers later joined the panel for a discussion on how food producers and buyers could make the most of growing opportunities. Indeed, opportunities for collaboration and business to business cooperation was central to the event that saw almost 30 producers from across the county showcase their products. “What we really want is to continue to provide opportunities for our Donegal food businesses to get to know each other, understand how they can benefit each other and ultimately continue to do business with each other. That will lead to benefits for the local economy and jobs for the region,” said Eve Anne McCarron, Business Advisor with Local Enterprise Office, Donegal. Those in attendance were urged not to be shy about their offering, but also asked to make sure they followed up on any contacts made on the day. “We would appeal to those who attended to follow the advice given on the day and keep the lines of communication they have built with their new contacts,” Eve Anne said. Feedback from the event has been hugely positive, but the many more food businesses in Donegal who could be part of the Food Coast Network have also been urged to join. Eve Anne explained that the network is open to all food businesses in Donegal, while there is also an opportunity for businesses in the county to apply for certification. The LEO executive stressed however that applications for 2019 are now being accepted and she appealed for interested food businesses to get in touch with the Local Enterprise Office. Those interested in finding out more should contact Margaret Campbell at the Local Enterprise Office – margaret.campbell@leo.donegalcoco.ie or 0749160735.